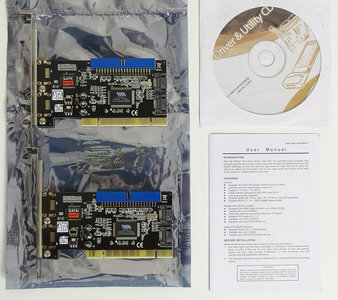 New set VIA VT6421 PATA & 2x SATA RAID controller PCI cards. PATA & SATA PCI controller card with RAID 0 or 1 setup option. Supports two PATA drives under UDMA up to 133 MB/s and two SATA drives. Requires Windows 98SE, NT 4.0 or newer.